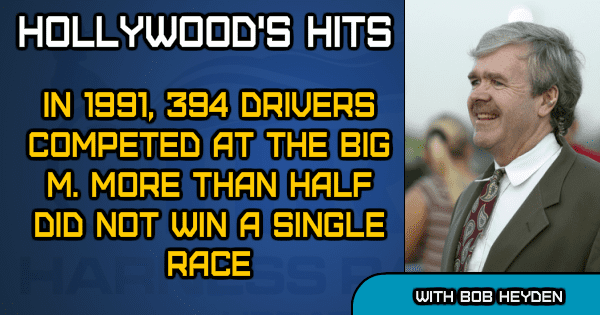 Hollywood’s Hits: Just how tough was it to win at the Meadowlands? In 1991, the Meadowlands’ driver colony featured 394 different drivers for the years. Of those, 204 (52 per cent), did not win a single race and 73 of them only won one race. Notable drivers who stopped by briefly included” Jay Sears 0-1, Trond Smedshammer 0-1, Roger Hammer 0-2, Del Miller 0-1 (at age 78), Ben Steall 0-1, Clint Galbraith 0-1, Randy Waples 0-1, Luc Ouellette 0-1 and Dave Magee 0-1. Also, every Triple Crown winner of both breeds since 1977 — expect Affirmed and American Pharoah who didn’t race at the Big M — has lost at least once at the Meadowlands. 1997 — Western Dreamer was third in that year’s Pace final. 2004 — Windsongs Legacy was beaten in the Hambletonian elim then won the final. 2006 — Glidemaster was beaten in the Hambletonian elim, then won the final. 2016 — Marion Marauder was second last year in the 2017 Cashman a year after winning the Triple Crown a year prior. He also was off the board in the Breeders Crown final won by Bar Hopping in his 3-year-old finale. Secretariat — Paul Feliciano, Jr.
May 8 is the date of birth for not only the sport’s richest ever horse Foiled Again in 2004, but three years earlier for Holborn Hanover, who became the first ever 1:46.4 winner on Hambletonian Day 2006. It is also the birthdate of Fresh Yankee in 1963. She would bide her time before becoming Horse of the Year at age 7 in 1970 and the first North American bred trotter to reach 7 figures in earnings. Full brother and sister Bret Hanover and Bonjour Hanover missed by a week of being born the same day in May. Three-time HOY Bret Hanover was foaled on May 19, 1962, followed by May 26, 1963 for Bonjour Hanover, the only winner ever of the filly Triple Crown. This year on May 30 will be the 40th anniversary of the foaling of Balanced Image, who, had it not been for a nagging injury three weeks before the 1981 Hambletonian might very well have been the first winner of that race in New Jersey (that honor went to Shiaway St Pat). Balanced Image went on to become the second richest sire of all time, less than a million dollars away from Speedy Crown with progeny earnings over $103 million. Not bad for a horse who banked $171,000 on the track. Deweycheatmnhowe turned 13 on Thursday (April 12). He is the only undefeated winner of the Hambletonian, a three-heat KY Futurity winner and the only post 10 winner of the Canadian Trotting Classic for a 7-figure pot. Dewey was the first of three straight sons of Muscles Yankee to capture the Hambletonian, followed by Muscle Hill and then a sales-topping yearling ($425,000) Muscle Massive. Seahawk Hanover was foaled April 22, 1978, giving him the same birthdate as his trainer Skip Lewis, who was slightly older. Nuclear Kosmos was also foaled on his trainer’s birthdate — May 4. Per Henriksen was born on that date in 1946, while Nuclear Kosmos was foaled in 1983. Dragon Again was foaled on March 7, 1995, meaning he was just 9 the day his son Foiled Again was foaled. Delmonica Hanover and John Campbell have the same birthdate — April 8. Delmonica was foaled in 1969 and Campbell was born in 1955. She was second twice in the Hambletonian of 1972 to Super Bowl the same year Campbell officially got his driving career underway. She also was the dam of Park Avenue Joe, the 1989 dead heat Hambletonian winner with Probe the year Campbell handled the Hambletonian favorite Peace Corps, who was third overall. Artistic Fella would have been 15 this coming April 20. The late son of Pacific Fella won the Meadowlands Pace in 2006 and in 2007 gave Tim Tetrick his first of 18 Breeders Crowns — by a nostril. Steve Elliott trained for Joe Alborano and this came in the midst of Elliott’s record streak. He was the first trainer to have four straight $2.5 million earners in the barn — a different horse each year: 2006 — Burning Point; 2007 — Donato Hanover; 2008 — Artistic Fella and 2009 — Well Said. April 25 is the 25th anniversary of the birth of Continentalvictory, the last female to win the Hambletonian. Stenographer was born on April 19, 1951 and remains today the only Horse of the Year not to get the most first-place votes. She got 23, to Scott Frost’s 24 in 1954, but outpointed him overall to win the award. Scott Frost then took care of business winning the next two awards and the sport’s first Triple Crown. He was very close to being the sport’s first three-time HOY. Call For Rain (a two-time Breeders Crown winner and sub 1:50 winner in the late 1980s) was born April 28, 1984. For trainer/driver Clint Galbraith, this was right at the time that his Niafirst became the first son of Niatross to win a race. Call For Rain was not a son of Niatross, but a son of his main rival Storm Damage. The first Saturday in May of 2004 brought us the undefeated Smarty Jones-taking on the world in the Kentucky Derby and winning it. The second Saturday brought us the foaling of Foiled Again. That’s an earnings difference of $39,977. The expression “Got Your Goat” stems from the age-old practice of trainers putting a goat in the stall with their prized thoroughbreds — often on the eve of a big race — to calm them down. It was a common practice. This tempted unscrupulous rival owners to sneak in and “get his goat” just to give their own entry a better chance.